Hoping to pick up the declining sales of midsize sedans, Hyundai Motor on Thursday said it has set the 2019 sales target of more than 70,000 units for the eighth-generation Sonata, a signature vehicle for more than three decades through which it has built its reputation. “By setting the sales target at 70,000 units this year, excluding (the number of vehicles to be sold) for commercial use, (Hyundai) will cement its No. 1 position in the sedan segment,” said Lee Kwang-guk, vice president for the carmaker’s domestic sales. Officially launching the all-new Sonata, the South Korean carmaker said it has changed most of the components “except for its name.” The company has applied the third-generation platform to the all-new Sonata for the first time, while adopting latest tech features such as a digital key and built-in-camera system. Also for the first time, Hyundai featured Bose premium sound system and high-performance tire Pirelli P-zero, to increase the product quality. Based on the design concept of “sensuous sportiness,” Hyundai illustrated a sporty and innovative design, and adopted a coupe-like frame, sloping roofline and low deck lid to make the body look longer. 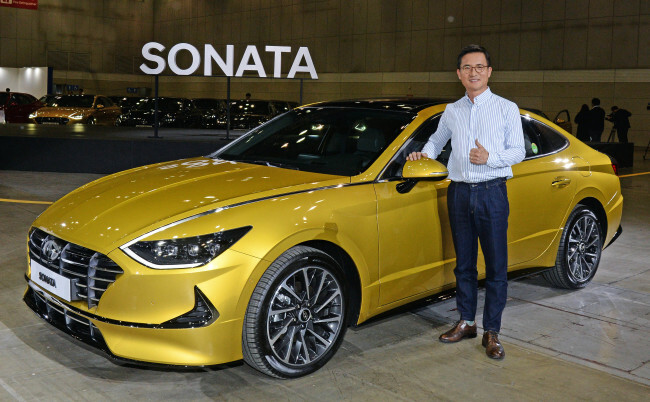 Acknowledging that customers favor sport utility vehicles over sedans, Choi Jin-woo, vice president for product marketing, said Hyundai will present its future vision of connected mobility and autonomous driving through its 34-year-old Sonata brand. “To introduce a new lifestyle, we have developed a new platform, smart stream engine, and new design identity for the all-new Sonata, also featuring smart technological devices to increase customer convenience,” he said. The price begins from 23.4 million won ($20,729) and goes up to 32.8 million won for the highest trim of the gasoline model. The company plans to launch the midsized sedan in US within the second half. Plans for the Europe debut are not set yet.